Not turning up to work is a pretty big no-no when it comes to staying employed. But, being stranded by a huge hurricane is a worthy excuse we think. Although, that wasn't the case for Adam Schrader, a writer from the US. 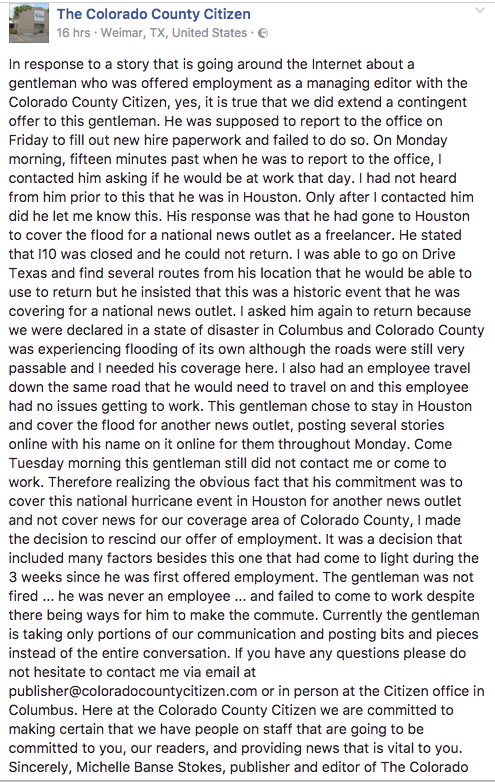 He was due to start a new job as editor of the Colorado County Citizen in Columbus, Texas. It's a pretty bad day when you lose your job, and get trapped in the biggest storm America has seen in years. Tough break. The newspaper have hit back, however, saying that they weren't warned in advance of Schrader's absence, and the fact he was freelancing for another publication was part of why his offer was taken away. The plot continues to thicken, however, with reports that both sides are in the wrong. The suburb of Houston that Schrader was staying in has since been purposely flooded to protect other parts of the city, and Columbus itself has been declared an evacuation zone. Emotions are clearly running high, but it looks like there's no way back after this public slanging match. Would be pretty awkward coming in to work next week getting daggers from the rest of the team. Oh well, this has been a good bit of PR for Schrader's new job hunt at least!